I took Cheyenne on his first trail ride today. He was doing great. Then about 20 minutes in he blew up. Cheyenne started bucking like he was trying out for the Reno Rodeo! I tried to ride it out. But, I just did not have control. I saw my opportunity so I bailed. Thank God I had my helmet on. 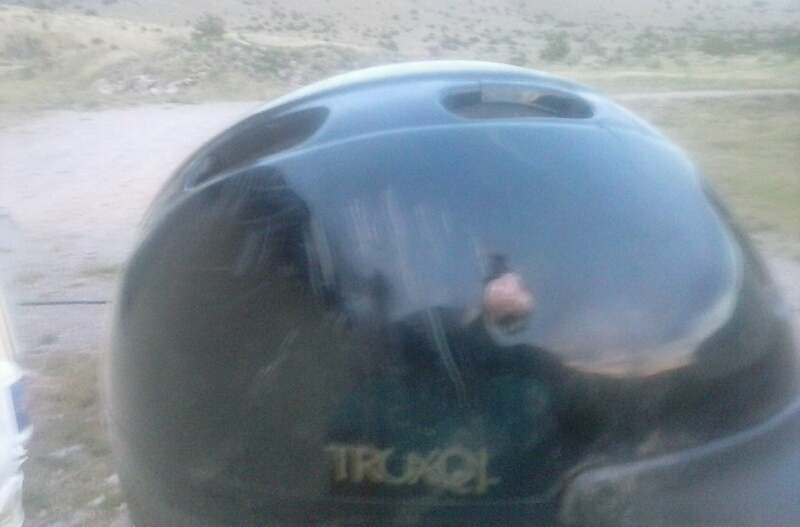 As you can see from the picture, the rock that is embedded in my helmet would have been in my skull. I have some road rash but I am OK. I am so lucky and thankful that I had my helmet on. It was not my horse's fault. He was not ready for the trail. I ALWAYS wear a helmet. I am buying a new one! Always replace your helmet after a crash!!!! !